The first issue of The Internationalist was put together using a set of printer’s galleys, a tin of cow-gum, and half a dozen sheets of Letraset (ask your parents). Its cover story was an interview with Julius Nyerere, President of newly independent Tanzania, first university graduate of his country, translator of Shakespeare into Swahili, author of African Socialism, and a political hero for many of us in that long ago time. A couple of years earlier, during our final undergraduate year, we had started a movement called Third World First.1 The aim was to raise money for charities like Oxfam by inviting students to sign a banker’s order donating one per cent of their incomes every year to overseas aid. More than 25,000 students signed up in the first 18 months or so and The Internationalist was launched as a termly magazine to keep them involved. Two years later, Oxfam and Christian Aid backed our proposal to relaunch the magazine as a monthly aimed at a wider audience. And so, 40 years ago this month, the New Internationalist was born with a cover price of 25 pence (60 cents), hardly any white space, and an interview with President Kaunda of Zambia. 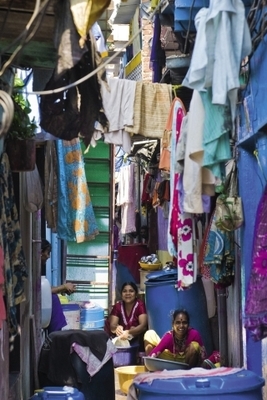 Making the best of life in a poor district of Mumbai, India – the struggle to meet basic human needs is ‘the great unfinished business of the 20th century’. Nyerere and Kaunda were not arbitrary choices. Both had argued that 10 per cent of all overseas aid, including the aid given by charities, should be spent on educating the public in the ‘first world’ about the real causes of world poverty. In essence, they wanted it to be understood that their poverty was not the result of some historical game of chance in which they happened to be the losers; it was the result of a set of economic relationships, rooted in the colonial era, that served to enrich a minority by impoverishing the majority. In one variant or another this has been a central message of the New Internationalist ever since. Looking back on those early issues provokes mixed feelings – and the mix is approximately one part pride to nine parts embarrassment. The pride part is obvious: for 40 years, the New Internationalist co-operative has helped to keep the flag of a fairer world flying and we are proud to have been involved in its beginnings. The embarrassment part is equally easily explained: far too much pontificating based on far too little knowledge. We were in our early twenties and did not know enough to understand how little we knew. Yet this did not inhibit us from pronouncing with confidence on international aid, trade, finance, commodity agreements, world hunger, population dynamics, and many other topics that we thought we had mastered sufficiently well to begin telling the world about. Such confidence was parented not only by youth and inexperience but also by the spirit of the times. And that spirit was overwhelmingly one of optimism. At home in the UK, the stuffiness and austerity of the 1950s had given way to a decade of economic growth and social liberation. Harold Macmillan’s 1957 prediction that ‘you will see a state of prosperity such as we have never had in the history of this country’ seemed to be coming true around us. Living standards were rising, inequalities were slowly being eroded, and the working class was by and large employed, unionized, and aware of its majority power. Socially, too, these were times of change. That first issue of the New Internationalist also carried an article by Roy Jenkins, the son of a coalminer who, as Home Secretary (1965-67), had ended capital punishment, legalized abortion, ended theatre censorship, and decriminalized homosexuality. Of course it was not all fair winds and clear skies. The threatening backdrop of the arms race and the Cold War, the ticking of the population ‘time-bomb’,3 the mass famines regularly predicted for the Indian sub-continent,4 the dawning awareness of environmental costs and limits, the new power of multinational corporations, the realization that economic growth itself was no panacea – all of these were big concerns. But in 1973 none seemed sufficient to dim our confidence in the progress to come. Above all, we expected the war on want to be won. And there was little soul-searching about what that meant. The sheer scale of malnutrition, illiteracy, disease and preventable death in the world of the early 1970s made debating ‘what do we really mean by development’ something of an indulgence. Whether in the General Assembly of the United Nations or in the pages of the New Internationalist, ‘meeting basic human needs’ was the mantra of the 1970s.5 And the great hope was that the day was coming when every man, woman and child on earth would have enough food, adequate shelter, safe water, basic healthcare, schools to go to, and the knowledge and means to decide how many children to have. Today’s is a more complex world, and today’s New Internationalist is a more sophisticated and better-informed publication. But its 40th anniversary may nonetheless be a good opportunity to revisit those hopes. The spirit of the times was overwhelmingly one of optimism. Living standards were rising, inequalities were slowly being eroded. Even taking only the very poorest countries, those with a 2010 per capita gross national income of under $1,000, what has been achieved is remarkable. Average life expectancy has increased from just over 40 years to just under 60 years. Child malnutrition and child death rates have been more than halved. Almost all children go to school and can expect, on average, more than eight years of education. As for the knowledge and means of controlling fertility, average family size for the world as a whole has been approximately halved from 6 to approximately 3 children per couple – a demographic transition that has astounded even the optimists of the 1970s by its speed and scale. Remarkable, too, is the progress against the major diseases and disabilities which devastated the lives of millions of families every year in the early 1970s. Immunization coverage, for example, has risen from under 20 per cent to almost 80 per cent across the low- and middle-income world. In the 1970s, the number of children being paralyzed every year by polio exceeded 500,000; the corresponding figure for 2012 was just over 200. Similarly, enormous if un-newsworthy efforts have protected about 70 per cent of families from the Vitamin A and iodine deficiencies which used to inflict blindness, mental impairment, frequent illness and early death on many millions in the 1970s. Slowest to give way has been malaria, especially in Africa, but three-quarters of the hundreds of millions at risk are today using insecticide-treated mosquito nets and this most stubborn of killers is beginning to retreat. This list of achievements could be doubled without too much strain; and by any historical standards it represents remarkable progress in little more than a generation. So why are we not all rejoicing? Of course it can be argued that progress cannot be expected to happen everywhere at the same rate, and that it can only be a matter of time before the basic advantages of progress are available to all. But such arguments ignore the fact that there are reasons why the poorest have been left behind. Exclusion takes many forms, but the principle is usually the same: the excluded are the politically powerless, the socially disregarded, the geographically isolated, the ethnically, or culturally discriminated against. And, until this changes, there can be no guarantee that ‘more of the same’ will do the job. Nor should it be forgotten that many of the most basic problems – whether it be lack of safe water or a disease vector or a micronutrient deficiency – are concentrated among those least likely to be reached by basic services (this would be too obvious to mention were it not for the fact that there has been a persistent tendency to see an improvement that reaches 75 per cent of a given population as meaning that the problem is three-quarters solved). Progress that leaves the poorest behind is not to be considered progress at all. At the same time, the progress of the majority has changed the political dynamics. Whereas once the poor and the marginalized had at least the latent power of their majority, the marginalized in many countries today are becoming a fragmented minority: a large minority in many cases, but still a minority. The traditional socio-economic pyramid is therefore morphing into something more like a diamond with its bulk in the upper middle, gradually making it easier for the new majority to disregard and disrespect those at the bottom. Instead, let me conclude with the prediction that, alongside related environmental concerns, it is the issue of equity that will be the great challenge of the next 40 years – and with a small proposal relevant to what can be done about it. Social statistics and targets have played an important role in the achievements to date and are a driving force behind the current Millennium Development Goals. But this has not always been the case. The progress of the first UN Development Decade in the 1960s was measured almost entirely by economic indicators. Then, in the early 1970s, when it was found that economic growth targets had been met but the poor had seen very little change, a campaign began to deploy new measures that would better reflect progress for people rather than economies. The widespread use of social indicators such as average life expectancy, school enrolment and literacy, child malnutrition and mortality rates, is now conventional practice. At the time, it seemed like a radical way of measuring progress. Today an equivalent revolution is needed. In the years to come, progress should be measured not by statistics that capture national averages but by data that capture what is happening to the poorest 20 per cent – in any country and for any indicator that is meant to measure human well-being. Even five years ago, such a suggestion would not have been statistically feasible. But data broken down by economic quintiles are becoming available for an increasing number of countries and an increasing number of indicators. For the first time, therefore, it is becoming statistically feasible to look specifically at what is happening to the poorest 20 per cent (the bottom quintile, known to statisticians as Q1). Statistics and measurement may seem abstract and lifeless. But their power should not be underestimated. Measurement guides policy, informs advocacy, makes possible transparency and accountability, and fuels media and public debate. Ultimately it is the choice of measures that is the clearest statement of aims and priorities. And if progress and protest is to be made against the Age of Inequality then, as in the 1970s, new measures are needed to reflect that new priority. The increasing use of Q1 – what is happening to the lives of the poorest 20 per cent – could be the equivalent of the effort in the 1970s to establish social alongside purely economic measures of progress. And it could help to underpin the message that, in the years ahead, progress that leaves the poorest behind is not to be considered progress at all. Since he left New Internationalist in 1980, Peter Adamson has had a distinguished career with UNICEF and still works regularly for its Innocenti Research Centre in Florence, Italy. Harold Wilson, speech in Kingston, Jamaica, 1 May 1975. See also William & Paul Paddock, Famine 1975! America’s Decision: Who Will Survive?, Little, Brown & Co, 1967. Two special issues of the New Internationalist on ‘How can the basic needs of all the people in the world be met’ were published in August and September, 1976. Progress for Children: Achieving the MDGs with Equity, UNICEF, Sep 2010. For a clear exposition of this trend in the US, see Robert Frank, Falling Behind, University of California Press 2007. This argument is presented in detail in Measuring Child Poverty, Innocenti Report Card 10, UNICEF, Florence, May 2012.